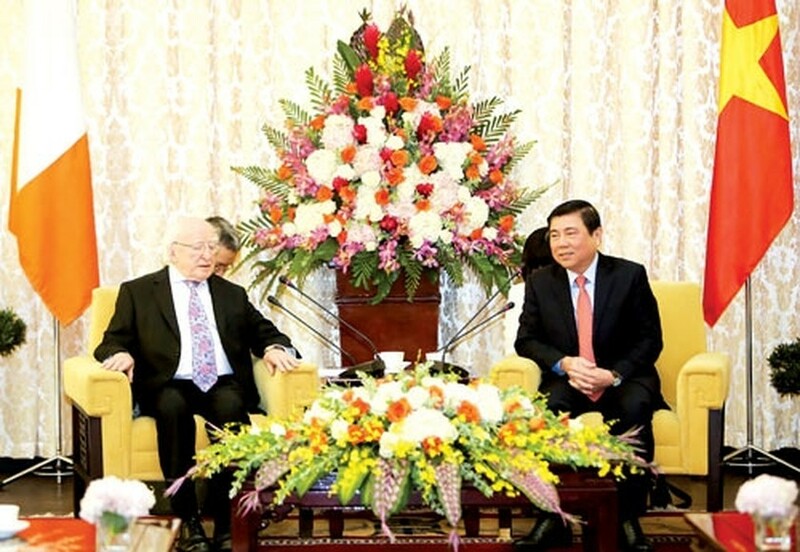 Chairman of the Ho Chi Minh City People’s Committee Nguyen Thanh Phong received Irish President Mr. Michael D.Higgins, his wife and high- ranking delegation at the Reunification Palace in the city on November 11. 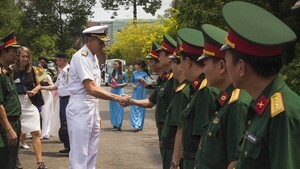 The city chairman expressed his pleasure about the visit from Irish president and high- level delegation stressing that this visit not only brings an important mean in the context of the 20th anniversary establishment of the Vietnam- Ireland diplomatic ties (1996- 2016) but also strengthens the two nations’ cooperation relations in the upcoming time. The efficiency of Vietnam- European Union (EU) Cooperation and Partnership Agreement (PCA) from October 1st, 2016 and towards the signing the Vietnam- EU Free Trade Agreement (FTA) will contribute strengthening further the trade and investment cooperation, added Mr. Phong. The two way trade turnover between Ho Chi Minh City and Ireland reached over US$ 165 million last year. In the first nine months of this year, the trade turnover was at US$ 107 million. Currently, the Republic of Ireland is positioned 30th among 79 countries and territories invested in the city. At the reception, the chairman hoped that Ireland continue boosting the cooperation in all potential fields with the city adding that the signing of the Vietnam and Ireland memorandums of understanding about education, airline and health will open new cooperation opportunities for the two sides. The Irish president has been impressive with the Vietnam’s outstanding economy, society achievements in the previous time. He also hoped that this visit will deepen the friendship, solidarity relations between the two countries’ people. This visit aims to strengthen the investment and cooperation activities of Irish businesses in the major sectors of education, health and fresh energy with the city. The Irish President and Deputy Chairman of the HCMC People’s Committee Tran Vinh Tuyen witnessed the signing of Memorandum of Understanding between businesses in the fields: the education, airline, health, biological research and preservation cooperation and assistance. As scheduled, Mr. Michael D.Higgi will visit the Southern Women's Museum before leaving HCMC to arrive in the northern province of Hai Phong.